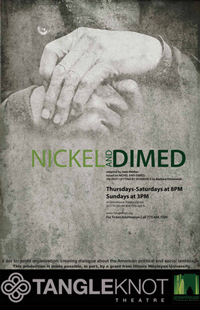 TangleKnot Theatre in Chicago presented Joan Holden’s Nickel and Dimed as its inaugural production July 19 through Aug. 11. 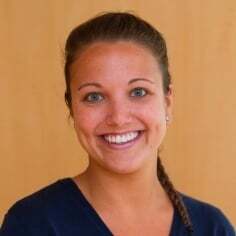 TangleKnot’s Artistic Director Dani Snyder-Young is assistant professor of theatre arts and head of the Bachelor of Arts in Theatre Arts program at Illinois Wesleyan. She also directed Nickel and Dimed, with alumna Britnee Ruscitti ’10 who served as assistant director. Curtis Trout, director of the School of Theatre Arts, was the production’s scenic designer. Alumnus Tristan Meredith ’12 was lighting designer, and Celeste V. Kelley ’13 designed Nickel’s costumes. Antonio Gracias ’12 was the production’s sound designer. Current student Sarah Menke ’15 received an Eckley Summer Scholar fellowship to serve as assistant stage manager and audience development and outreach associate. The project was funded in part by an Illinois Wesleyan Artistic and Scholarly Development grant to Snyder-Young and Trout.